This is Chip. Chip is a father to five boys (JJ, Brett, Duke, Tag and Tor) and a loving husband to his wife, Shannon. He’s a community football coach, a lifelong learner and a voracious reader. He’s also a former athlete, an IRONMAN and a huge fan of the Offspring. Most days you can find Chip on the Grouse Grind by sunrise, and at Nelson the Seagull shortly thereafter (“best poached eggs in the city”). From coffee, he’ll walk to his Gastown office, attend a few meetings, work on his memoir, run to a speaking engagement and then head to the gym. He epitomizes full-contact living; his brain never sleeps. He’s solving athletic apparel problems before athletes have even identified them. He’s an innovator and loves to disrupt the usual patterns of thinking. He founded lululemon athletica before you knew yoga was a thing. He’s done some other cool stuff, too. For his full bio, check out his LinkedIn profile. Current One-Year Goal: To complete 21 days of walking on the El Camino trail in Spain and Portugal by December 2019. This is Shannon. 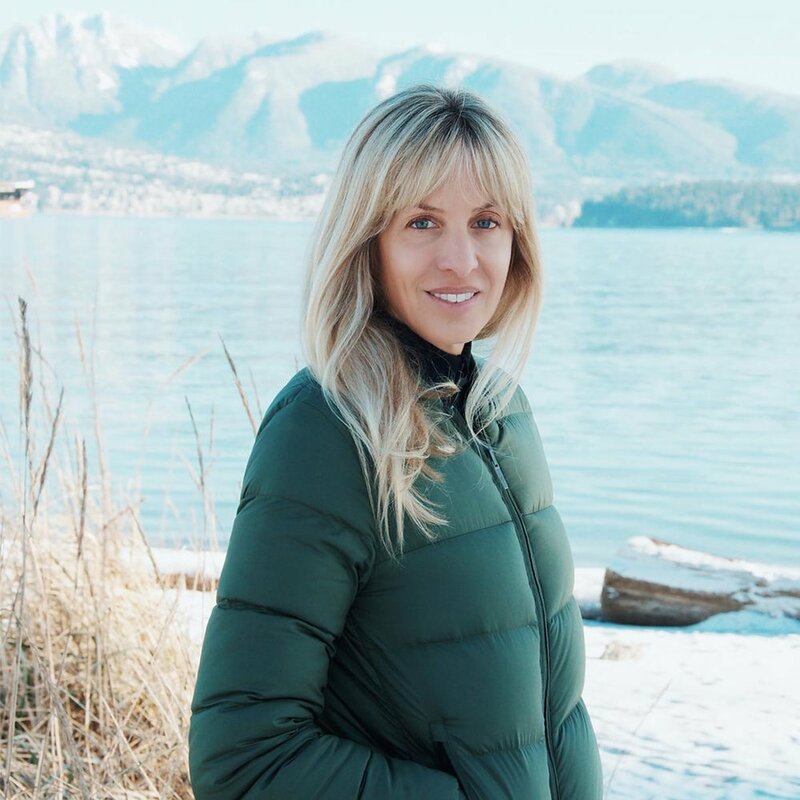 Shannon was a lead designer at lululemon, where she created some of the company’s most iconic designs, including the Scuba Hoodie and the Groove Pant. Since then, she’s gone on to found imagine1day and the Wilson School of Design at Kwantlen Polytechnic University with her husband, Chip. These days, Shannon is all about fun, family, philanthropy and a good sweat. She’s a newly certified personal trainer, a mom to Duke, Tag and Tor, and a step-mom to Brett and JJ. With a houseful of boys, Shannon’s on the go from dawn to dark, but she’s always ready for an impromptu workout. In 2014, she and JJ founded Kit and Ace, a technical apparel company for people (like themselves) living full-contact lives. When she’s not with her boys or working on the family’s latest philanthropic endeavour, you might find Shannon at Revolver Coffee in Gastown, walking at Jericho Beach when the tide is out, or driving through Kits in her 1971 candy apple-red Ford Bronco convertible. For more on her career and philanthropic efforts check out her LinkedIn profile. Current One-Year Goal: To not get a cold or flu for all of 2019! This is Warren. He loves good coffee and is allergic to salad. Warren is an early riser who can usually be found on the Grouse Grind and other North Shore trails (all year round) or on his road bike (rain or shine). As someone who has a hard time sitting still, Warren spends his weekends on some combination of backcountry skiing, kiteboarding, woodworking, hiking, or camping. He is the proud father of Ryan and Lainey, and also a proud born & bred Vancouverite. He escapes the rain with weekend trips to Whistler and Palm Desert or by taking adventure vacations with his family. Next on his bucket list? South Africa. He is known around the office for being a man-with-a-plan, leading epic white-board sessions and always starting with ‘why.’ Warren is a dedicated philanthropist who spends a great deal of time proudly serving on the boards of both the Boys & Girls Club of South Coast BC and the BC Women’s Hospital & Health Centre Foundation. Warren is CEO of Hold It All. He is a highly accomplished executive with over 25 years of progressive experience at some of Vancouver’s most notable companies. For more on that, check out his LinkedIn profile. Current One-Year Goal: Complete overnight backcountry ski trip by December 2019. This is Andrew. Andrew and his wife Ciara are the true definitions of foodies, frequently traveling the globe in search of the next culinary gem. On the weekends, if he’s not at the soccer field cheering for his son, Ben, he can be found skiing, playing a mean game of tennis, or running along Vancouver’s beautiful Spanish Banks. As a seeker of quality in all aspects of his life, Andrew is very passionate about art and architecture and is slowly amassing his very own art collection. Andrew is a planner, just ask him... he probably has restaurant reservations for a year from now! A true sun seeker, Andrew enjoys quick trips to California or long summer excursions to the Mediterranean. Andrew is CEO of Low Tide Properties and has more than 25 years of experience in the real estate sector, bringing with him a uniquely global perspective from living and working in Hong Kong, London, and Vancouver. Current One-Year Goal: Accompany my son on a college/university tour in the US and in Canada by December 2019. This is David. David is a man of few words and infinite possibility. If you ask him how he’s doing, he will give you one of three answers: amazing, fantastic or outstanding (because no one has ever given him a good reason to choose any other way of being). David does the Grouse Grind 60 times per year and has an Excel spreadsheet to prove it. He spends most of his free time with his two daughters Kaylee and Ashley and can be found anywhere from the pool to the soccer field to bingo night. He is a collector of antiques, specifically light fixtures, fine china and silverware. (The man has a strawberry serving spoon.) His idol is Joe Segal, who continues to work at 93 years old. David loves what he does and wants to work forever. David is CIO of Low Tide Properties and brings with him more than 30 years of experience in the real estate industry. Current One-Year Goal: Do the Grouse Grind 61 times in under 60 minutes by December 2019.